"There were a lot of not unjustified comments on that," he said. "I think the gunplay's improved in many ways, but I think one way that's subtle but makes an incredible difference to the feel of the game is to reduce the impression of bullet sponginess. That isn't just a question of fewer bullets, though time-to-kill has been adjusted. You're going to kill enemies much faster, but they're going to kill you much faster too, which really puts the emphasis on cover-based gameplay. "The other thing is, there are many more animations," Gerighty continues. "Hit animations, movement animations. Some other shooters, they're bullet spongy as well but you don't notice it because those enemies recoil when they get hit. There's a lot of craftsmanship that goes into masking the RPG number side of things." In the demo I played at the event in question, I also saw a few promising abilities designed to deal with heavily armored enemies. The chem launcher, for example, can create corrosive, armor-eating clouds. I'm hoping other tech options offer similar solutions to big tanky dudes. There’s also the more robust animations which Gerighty described. The final boss of my demo mission was a heavily armored dude named Saint, and between my chem launcher and both me and my teammates' guns, Saint was constantly staggering and did not last long. As Gerighty explained, this was partly thanks to The Division 2's more strategic armor system. "One other thing is the heavies," he said. "The armor is localized, so they have pieces on their arms, chest, head. You need to melt that way, and you'll see it snap away. You'll have this visible indication that, OK, it's bullet spongy, but there's a reason why it's bullet spongy. It's armor. And once you get rid of that, you hit that chewy center in the middle and that's it. That enemy's going to go down." I was almost surprised how quickly Saint died, especially after my experiences with the flamethrower dudes in the first game. It was certainly refreshing. The abundance of bullet sponges was one of my biggest criticisms when The Division first launched, so I was always hoping the sequel would tone them down. At the very least, the fact that me and three random pickups could utterly delete Saint using little more than decent aim and suitable tech bodes well. 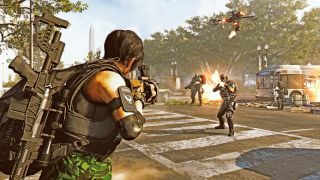 We played The Division 2 endgame earlier this year, and finally seeing it in action cleared up some of our other worries as well.